Tired of the election debate already? Why not consider A REAL ECONOMIC PLAN, not the pretend plan called “Jobs and Growth” put forward by the LNP and Malcolm Turnbull. Their plan is a cover story for cutting government spending so wealthy individuals and foreign corporations can pay less tax. Here I have reprinted – without express permission – the third of Bob Katter's “Letters to My Fellow Australians”. * His first two letters describe the dire situation we find ourselves in now and explain his views on why things have gotten so bad. In this third letter he makes a number of suggestions for real economic growth in which Australia will directly benefit. These plans are not based on nebulous hope that foreign investors will be attracted to Australia and save the day, as if this would ever be their aim. Rather he makes at least 10 different and specific projects, mostly for Northern Australia and WA. He also has ideas on defence – submarines and larger patrol boats (made in Australia of course), tax, welfare and affordable housing. For the First Australians he proposes they be given Ownership Title Deeds to their lands. These figures by definition are notional, not specific. Some extrapolation of necessity has been used. They are taken from reports and submissions to government, and or to financiers. The figures supplied, for clarity, are rounded off. The employment figures use the economist’s rule of ‘ten jobs for every million dollars created’. 1. All motor vehicles purchased under a govt. contract must be Australian made. Increased Income for the Aust. Econ. $4000m per year. Creating an Extra 40,000 jobs. 2. Ethanol blended at 10% into all motor vehicle fuels. Introduction over a 5 year period. On the Brazilian experience this percentage will grow to a 50% content. Increased Income for Aust. Econ. $12,000m per year. Creating an Extra 120,000 jobs. 3. Adopt international standards for Prawn, Fish and Crayfish production. Creating an Extra 100,000 jobs. (b) Provide “First Australians” (e.g. Land trust areas) with Ownership Title Deeds. (c) Provide small towns with the right to Micro Irrigation Schemes. Increased income for the Aust. Econ. $4,000m per year. 8. NADA to finance Qld Rail to build a Railline to access and open up the Galilee Coalfields (The Galilee contains half of Aust.. known coal reserves). Increase in Income for Aust. Econ. $4,000m per year. Increase in Income for Aust. Econ. $3,000m per year. Creating an Extra 30,000 jobs. 10. NADA to build the Revised Bradfield Scheme – taking a very small amount of the High Elevation flood water of Far N. QLd - Upper Johnstone, Tully, Herbert and Burdekin – Rivers and turning them back through a break in the Great Dividing Range and out on to N. Qld’s rich black soil (Mid-West) plains. 11. The Defence Protection of Aust. probably requires 15 submarines and maybe 100 Patrol Boats. A small country cannot afford a Coast Guard and a Navy, so a bigger type of Patrol Boat is needed to be able to perform both of these functions. In the age of missiles and drones a Patrol Boat needs to be built with a missile-drone capacity. Boats built to be able to change to a naval defence role in a time of conflict and in peace time such boats can do the Coast Guard job. Creating an Extra 10,000 jobs. The Abolition of the G.S.T and its replacement by a Financial Transaction Tax (FTT). A two per cent tax on every credit card, every cheque, every financial transaction. This tax catchs stock market transactions of $1,191b a yr and superannuation purchases of foreign shares $30b a yr.
Familys with dependent children of around $20,000 per yr.
Familys with dependent children through lowering their tax bill by income splitting $12,000 per yr. Retirees: a financial grant to each retiree of $9,000 per yr.
All principle cities to have high speed (120km per hour divided highways) 60km spoke roads radiating out the city centre to areas with 2 acre subdivisions. These 2 acre blocks with water, a median strip of bitumen, electricity and most importantly of all, no restrictions upon such subdivisions . These blocks maybe some 40klms from the city. At 120k/hr this is 30 minutes to the inner city periphery, to inner city parking and people movers. This reduces land prices for housing to around $65,000 for each 2 acre block. A small ‘first home’ can be constructed for as little as $100,000. This reduces the average annual cost of accommodation in Australian citys from around $40,000 a year to around $16,000 a year. This provides space for a family to grow, fun for kids, freedom from the rat race, every man a king on his own little kingdom. There must be a movement. It needs donations, cadres, and workers. A movement that will back politicians into Parliament that will adhere to this program of survival and advancement for our homeland - Australia. To all, the good Lord’s blessings. Think Beyond the Current Election! 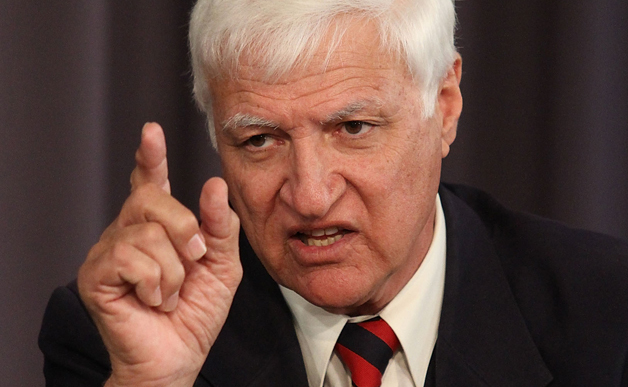 Have a Read of Bob Katter's Second Bombshell!